This article was published on 07.31.14. Catch Salt Wizard on Friday, August 1, at Shine at 1400 E Street. The show starts at 8 p.m., and the cover is $5. Desario and Duplx are also on the bill. Learn more about the band at www.facebook.com/saltwizard. The drought might be costing the state billions, killing livestock and eliminating jobs, but Salt Wizard’s creative process, luckily, has remained unscathed. 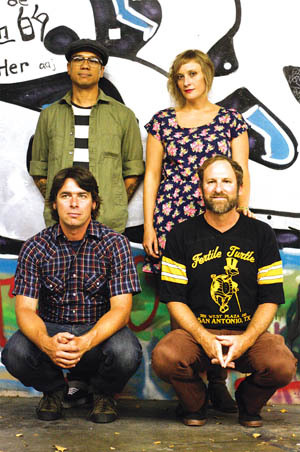 Water is a huge influence for the West Sacramento alternative indie band, after all. Singer-songwriters Rachel Lomax and Eric Warren live together near the Sacramento River. Their bedroom recording studio is called Riverbank Records. Separately, they wrote the songs on Salt Wizard’s debut, self-titled album—released in May—and there’s a remarkable amount of aquatic imagery. The bandmates’ common connection to water is only trumped by their commonly crazy schedules. Melcer is a researcher for the state while completing his Ph.D. at UC Davis, studying Sacramento’s rivers and ecosystems. Lomax also works full time at a mental-health clinic while finishing up a graduate program on weekends in San Francisco. Warren works on-call in medical transportation. Drummer Anthony Ordonez works in graphic design. Getting them all together at the same time is tricky. Salt Wizard formed about two years ago. Warren and Ordonez were both in E-Squared, the Sammie award-winning jazz band. Lomax was already entrenched in the local music scene as part of Be Brave Bold Robot and Light the Beacon Fires. Unrelated to music, she and Warren started dating. Then Lomax met Melcer, who also plays with the Neighbors, on the open-mic circuit. The band’s first album is a collection of songs written by Lomax and Warren, which means it moves between two pretty distinct styles; Lomax brings a quirkier, dark folk edge to pop songs, while Warren brings more experimental, jazz and noise elements. Now, all four members are writing new songs together. And while the first batch of tracks were sweet easy-listeners, the band says the new songs are simultaneously more groovy and baroque. For the record, Warren does care about being stuck eating macaroni forever. He loves food too much. In fact, that’s how the band got its name. Warren and Lomax were camping, and they entirely forgot seasonings. No butter, no spices, no salt. “We wished there was a magical being that would come and season our food,” he says.